Looking for a stylish, sustainable way to heat your home? Then a woodburning stove could be the answer. Whether you’re after a traditional-looking version to warm a cosy sitting room or a cool contemporary design to sit at the heart of an open-plan living space, you’re sure to find something to suit. But how do you select the right appliance for your needs? Our Q&A will help you decide. 1) Why should I go for a woodburner? 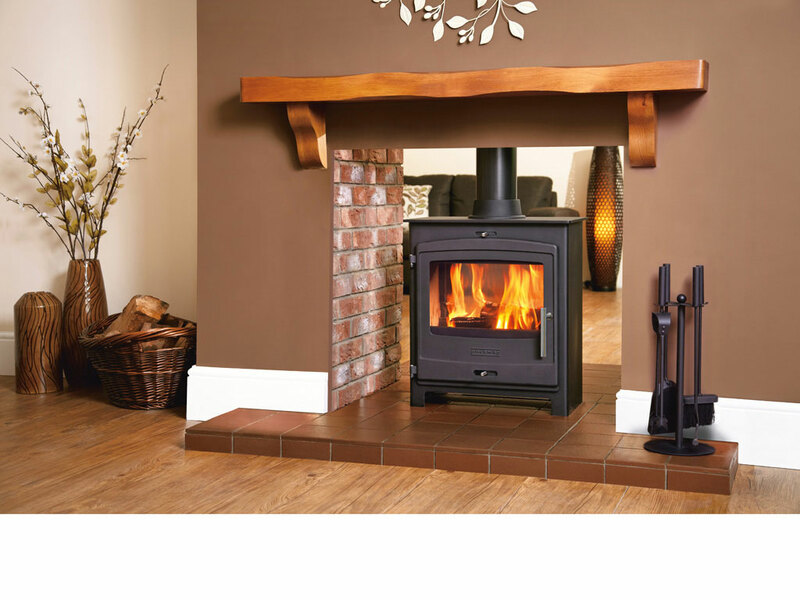 Heritage Fireplaces offer a wide selection of wood burning stoves. You can buy online and take delivery to your door, additionally we offer a fitting and delivery service combined. Give us a call on 0116 251 9592 with your location in the UK and we will happily provide a competitive quote. Alternatively, send us a message via our website Contact Form. These stoves offer a great combination of aesthetic appeal and eco credentials that few heating appliances can match. From classic cast iron models to designer versions in steel or ceramic, they make for a captivating focal point. And with technology allowing for ever-larger viewing panes, the beauty of a real log fire can be enjoyed to its fullest. Add to that the fact that responsibly-sourced, well-seasoned timber is a carbon neutral and energy-efficient fuel, and these stoves stand a class apart as attractive, practical heaters. 2) What are the style options? The traditional matt black firebox set atop four solid legs has enduring appeal for both period-style homes and contemporary spaces – but these days there’s a huge array of statement designs to choose from. Switching the enamel to a different colour – from sleek whites to eye-popping pinks – can help to ensure your stove adds an extra dimension to your home’s decor. Then there are wall-mounted and pedestal versions, or even models that appear to be suspended in the centre of a room. The classic double-aspect stove is another great choice; and has now been taken a step further with the introduction of show-stopping 360° designs. If you prefer a clean look, then a cassette model that fits flush with the wall – perhaps integrated into a log store – could be an ideal option. 3) How much heat can I get? The vast majority of stoves are sold as individual appliances designed to provide a cosy atmosphere in a single room. You can get a general idea of the size of room heater you need by measuring the space in cubic metres (L x W x H) and dividing this figure by 14 to reveal a rough estimate of the kilowatt (kW) output required. For example, a 7m (L) x 5m (W) x 2.4m (H) living room might need a 6kW stove – but you should always use a qualified heating engineer to determine the exact output required. Some appliances can be hooked up to radiator-based central heating and even supply domestic hot water for taps and other outlets. Typically, these boiler stoves can run around 12 radiators either as the primary heat source or in tandem with a conventional gas or oil-fired boiler (in which case the stove works to reduce your reliance on fossil fuels). Stovax’s Stockton 14HB is a 14kW model able to supply enough hot water for a network of 19 standard-size radiators. We love this style and it’s a popular choice when you want to heat a large room effectively, the double sided door design is a great feature to have on those cold winter days. 4) How efficient are woodburning stoves? There’s really no comparison between stoves, which burn at between 70%-85% efficiency, and open fires that waste about 90% of the warmth they generate by blowing it straight up the chimney. But how do woodburners size up to conventional boiler-powered central heating systems? According to the Energy Saving Trust, a log-fuelled boiler stove hooked up to radiators should cost around £90 less to run every year than gas-fired heating. However, unlike some types of biomass, log burners aren’t eligible for payments under the Renewable Heat Incentive. If you’re interested in taking advantage of this scheme, then you’ll need to invest in either a wood pellet stove or a full-blown biomass boiler. 5) What features should I look out for? Modern stoves offer a plethora of advantages over older models – mainly aimed at either boosting efficiency or improving views of the flames. Airwash technology, which is fairly standard these days, draws air down the inside of the window to help keep it clean and get rid of performance-impairing residues. This air will also act as the primary supply for combustion of the wood. To further improve performance, cleanburn systems introduce secondary and tertiary air into the chamber. By combusting the excess hydrocarbons in the smoke, this boosts thermal efficiency and ensures a cleaner burn – reducing the amount of unpleasant particles that go up the chimney. If you live in a smoke control area, you can still have a stove. Many models offer a smokeless burn – check whether the product you’re interest in carries a Defra exemption certificate. 6) Who can install my stove? Heritage Fireplaces offer installation – Call us on 0116 251 9592 with your location for an accurate cost proposal. Fitting a woodburner is notifiable work, so your installation must conform to the Building Regulations. The most straightforward route to compliance is to use a suitably-qualified HETAS engineer, who will be able to self-certify the job as a competent person. This isn’t just a case of nestling an appliance into an existing chimney. All woodburners need a flue to channel the expelled emissions out of the home. This will usually be run up your chimney, which may need to be re-lined at a cost of around £900-£1,100. Typically, your installer will also deal with calculating the right size of stove and, once it’s commissioned, run you through how to operate the appliance effectively. 7) Which woods work best? 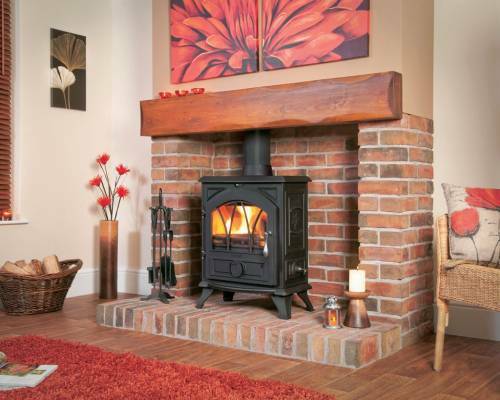 As a rule, hardwood is your best bet for fuelling a stove. Its density means a cubic metre of this fuel can weigh up to 50% more than the same volume of softwood. So if you’re buying by volume (which is pretty common) you’ll get more fuel, a longer lasting burn and have less need for storage space by opting for hardwoods such as ash, oak and beech. If there’s any excess moisture in the timber, it will take time to boil away in your stove – producing steam rather than heat and reducing its efficiency. In the worst case scenario, the wood may even produce tars that could damage the stove lining. So it’s important to only use properly seasoned products – and most stove manufacturers recommend wood that’s been taken down to a moisture content of 25% or less. With hardwoods, this will generally mean using logs that have been cut and split well before they’re to be used and that have gone through at least two summers’ worth of air-drying before buying. It is possible to purchase green wood for home drying, but bear in mind you’ll need a significant amount of storage space for this, and will probably need to split the logs yourself. 8) Where can I store the fuel? It’s vital that you keep your seasoned wood in a suitably dry place; a well-ventilated shed with one open end is a good option for long-term storage. Logs should always be kept off the ground – typically by stacking them on top of the biggest lengths, with gaps for air to circulate. The firewood should always be cut to the right length at least six months before it’s to be burned to ensure that it dries out properly. Splitting it to expose a greater surface area will help, too. You can buy pre-seasoned fuel from the likes of Log Delivery and Certainly Wood; both offer kiln-dried hardwoods, too, which should be ready-to-use within two weeks of delivery. The Forestry Commission recommends you bring wood indoors for a few days prior to use. 9) What about stove maintenance? Provided you stay on top of basic upkeep, such as clearing out the ashes and removing any stubborn soot from the glass and internal surfaces, you should get 20+ years of life out of your new woodburning stove (though most warranties stretch to just five years). It’s worth keeping an eye out for signs of potential problems – such as holes in the ash pan, cracks or spots of rust in the finish. If you notice any of these, it’s time to call in a specialist. Most manufacturers strongly recommend a professional annual service (at around £70-£100) both of the stove and, importantly, of the chimney and flue. 10) How much do woodburning stoves cost? A small room-heating woodburner can start from as little as £600 – but even with this kind of installation, you may be looking at upwards of £1,500 once you’ve factored in professional fitting and a new flue. A constructional hearth (which can be required for the setup to meet Building Regulations) will cost at least £350. If you’ve set your heart on a high-end product or you’re opting for a boiler model that requires new pipework, you can expect to pay significantly more – typically anything from £3,000 to £7,000 in total. Reference: DOC-ALPH1 – The Alpha 1 multi fuel stove features state-of-the-art clean burn pre-heated tertiary air which wrings out every last bit of heat from your fuel to maximise efficiency and create a greener, better burning stove. 84% efficiency. Maximum Output 4.9 kW. Call us on 0116 251 9592 quoting the Britain’s Heritage Fireplaces reference “DOC-ALPH1” or fill out our contact us form here.